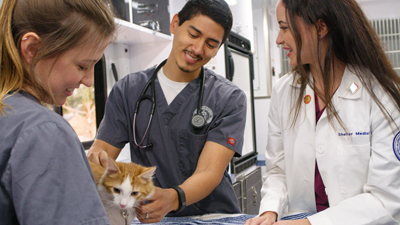 PetSmart Charities announced it is donating more than half a million dollars in total to 21 of North America’s veterinary colleges and universities to fund new scholarships, research grants, and student ambassadorships. Through this investment, the organization said it hopes to foster career interest in the field of shelter medicine and empower veterinary students to promote and preserve the human-animal bond in local communities. Since 2015, the nonprofit has granted more than $6 million to veterinary colleges and universities to fund programs in the U.S. and Canada that provide students with hands-on experience providing emergency relief or performing vital procedures such as spay/neuter surgeries in local communities. “At PetSmart Charities, we know that shelter veterinarians play a crucial role, not only in providing care to pets in need within an animal welfare organization, but also in offering quality care to pets in underserved communities where pet parents require access to affordable health and wellness services,” said Dr. Landis-Hanna. PetSmart Charities has partnered with Colorado State University, Cornell University, Lincoln Memorial University, Louisiana State University, Midwestern University, Mississippi State University, the Ohio State University, Oklahoma State University, Purdue University, Texas A&M University, Tufts University, University of California, Davis, University of Georgia, University of Florida, University of Guelph, University of Missouri, University of Pennsylvania, University of Tennessee and Western University. Discussions are also underway with an additional two universities. Each institution will receive funding for up to four scholarships of $1,000 each to be awarded to one or more veterinary students with an interest in studying the human-animal bond or shelter medicine. Partner schools also will receive $5,000 earmarked to support a student-led research project, complete with an additional $1,000 travel grant to present their findings at a prominent animal welfare conference. To help raise on-campus awareness about the scholarships and research grants made possible by PetSmart Charities, each university can recruit an on-campus student ambassador. The ambassador will represent PetSmart Charities’ mission on campus by engaging fellow students, faculty and the community in events like adoption fairs and pet food drives. Each ambassador will receive an honorarium of $750 per semester and will have access to funds they can use to host events or produce marketing materials to inform and engage their fellow students in attending upcoming events or applying for the new funding opportunities available at their college or university. “By providing holistic funding that supports research, education and student engagement at 21 leading postsecondary institutions, we hope to help the veterinary leaders of tomorrow better understand and appreciate the role veterinarians play in PetSmart Charities’ mission to support and enhance the bond between people and pets,” said David Haworth, DVM, PhD, president of PetSmart Charities. To learn more about PetSmart Charities and PetSmart Charities of Canada, please visit PetSmartCharities.org or PetSmartCharities.ca.